Wanting something with gore and strategy?? A show that makes you think?? This show is unique in so many ways..
1) A comic like art style. 2) Seeing different fighting styles and war strategies. 3) Making the connection between the characters and real history idols. I'm not usually a huge fan of historical type things, but the fantasy added into this one puts it more up my alley. The action is wonderfully over the top and bloody, the animation is pretty creepy sometimes, and the occasional humor is spot on. I don't really understand why Yoichi is... like that... aside from fan-service of course, but canonically it doesn't make much sense. Overlord meets Fate/stay Night with artistic style of Hellsing. In my opinion, it is a must-watch! Warriors are gathered from throughout the ages... yada, yada. You know the drill there. But with the gritty fights and artistic styling of the classic Hellsing, this certainly amps it up. Can't wait for the second season. As title implies, this show can be a bit hard to follow. I think, if I knew more about Japanese history in general, it would have been even more enjoyable! Lot's of characters in this show, lot's of factions, and players in the narrative, so that also gives it a hard to follow sense. That being said, it is really well animated with a unique style and killer fight sequences. It's by Helsing studio I believe, so that makes sense. The three main characters are pretty cool, and seeing them take on enemies in different ways is really satisfying. For only being 12 episodes right now, it is definitely worth a watch. I don't think this series will be getting a second season, so it was just left off at a weird spot. The manga is hard to follow too, and it gets updated every 1,000 years. I lost interest in keeping up, but the anime was well done! The art and voicing was spot on!! 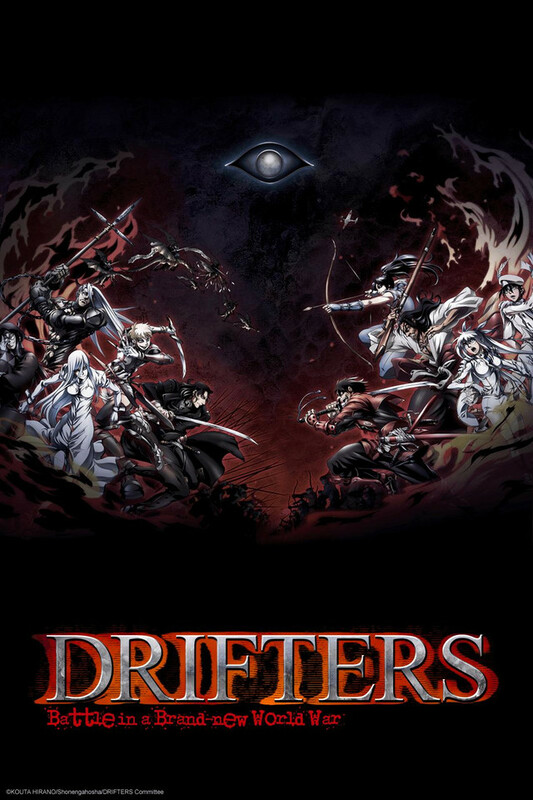 I watched Drifters because it was highly rated. Sure enough, it didn't disappoint. Combining figures of history and putting them in a fantasy world seems like a pretty weird idea. However, it really made for a compelling story. The depth to each character was really refreshing and the choices they make had several layers to it. That being said, the action was incredible. Strategy and incredible fight scenes are key features throughout every episode. The pacing was amazing. From a stylistic standpoint, CGI was also tastefully done. I, personally, do not like a lot of CGI in anime. This anime really hit it on the nose. It was barely noticeable. CGI was only used in scenes that didn't really matter and for less than 2 seconds each. It was used as a tool to get to the important scenes and not as a crutch. Overall the quality of this anime is truly 10/10. Even if you don't know anything about history, check this anime out. You'll learn a lot and you'll really enjoy it. This is my opinion and not fact, I do not write reviews normally but I liked this anime. The idea of this show is great in my opinion. I love the way the show makes you really hate the antagonist. The hero's in the show are not "do-gooders" sure they fight for good but the way they act makes them very gritty and question if they are the the good guys. also I just like the music and art style. Can not wait until the second season! The anime was brutality awesome and hilarious.The combination of fantasy and historical figures was absolutely crazy in a awesome way! Each character is different and funny in there own individual way and I just love it! I just really loved the anime and I am patiently but eagerly waiting for the next season!